Investment income is a huge profit driver for life insurance companies. We've spent a lot of time analyzing and reporting on overall investment yield trends for life insurance companies, but that analysis only compares the raw yield insurers achieve on their managed asset pool. It's possible that a declining yield simple indicates a de-risking strategy. Investment income is not necessarily declining and the insurer is under no real financial trouble. In fact, we've made this argument several times when discussing these trends and others. So if we instead look at the absolute amount of investment income and how that has changed over time, do we see any trend that indicates declining overall income? That's the question today's analysis seeks to answer. Insurance companies have long proven successful at accumulating assets. In fact, total asset growth at most major life insurers remains impressive. Given this growth in managed assets, there's reason to believe that declining investment yields still net positive investment income growth. In other words, a company that experiences year-over-year decline in net yield on invested assets may not be losing money or as much money as we might assume since they are achieving net gains from a higher basis of which they derive yield. An example will help ensure understanding. If I have an asset pool of $100,000,000 and I achieve a 4% net yield on my assets, my net investment income is $4,000,000. If my yield drops to 3.5%, but my asset pool grows to $120,000,000 then my net investment income increases to $4,200,000. To be clear, this reality isn't necessarily ideal for most insurers. More assets can mean more policyholders, and if this is the case that could mean lower overall benefits (i.e. cash value growth of permanent life insurance policies) for each policyholder. However, the equation is a tad more complicated than this. Insurers target profits through various activities based on policy features (i.e. guarantees). These guarantees represent required income the insurer must produce to cover the anticipated expense. Income–regardless of source–that exceeds the target for these features represents cash flow that could go towards augmenting dividends or interest rates on cash value life insurance policies. Looking at major life insurers in the individual participating whole life insurance marketplace, we've calculated the average annual change in net investment income from years 2010 through 2014 (the most current figures available). We've opted to calculate the average per year change over this time period rather than simply the compound annual growth rate from 2010 to 2014 because this could significantly understate or overstate the impact of a very bad or good year respectively within this timespan. The most impressive and interesting result comes from Penn Mutual. Penn is one of only two companies that achieved a positive trend in terms of investment yield from our comparison published in May of last year. 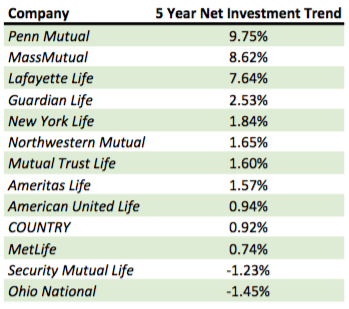 The fact that Penn Mutual tops this list with a nearly double digit growth rate in absolute net investment income for the last five years is very commendable. The rather large gap between rank position three and four is also intriguing. MassMutual and Lafayette Life follow Penn Mutual with average annual growth rates of 8.62% and 7.64% respectively, but Guardian Life takes fourth place with only 2.53% average annual growth. Given Lafayette Life's mediocre placing in our comparison of investment yield trend, we can only infer that the company has achieved much higher than normal asset growth over the same period. Only two companies show negative average net investment income growth, Security Mutual Life and Ohio National. Both companies were somewhat middle-of-the-pack performers in our investment yield trend analysis, so it's likely that both are experiencing trouble with declining yields that push total investment income below prior years. The average growth rate among the entire group is 2.70% and the median is 1.60%. As we've explicitly mentioned in past comparisons, this is but one metric in a sea of many. While we will always argue quite strongly that investment income metrics are among some of the most important, there are other attributes to review before making any definitely decision about a life insurer–especially when evaluating one for the intentional accumulation of cash value.